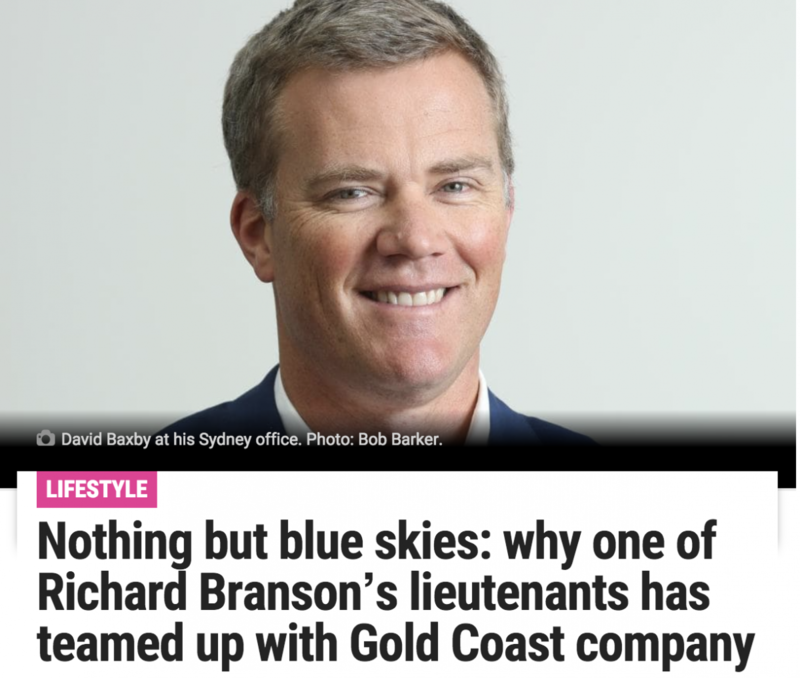 He’s been a long-time lieutenant of Virgin’s global founder Richard Branson. He helped grow the Virgin Australia business to 150 jets and transform the Australian aviation landscape. He subsequently became the global chief executive of Branson’s Virgin Group — a conglomerate of licensed branding in travel, credit cards, telecommunications and health clubs. And he also ran Global Blue, a $1.4 billion tax-free shopping company in Geneva. In 2012, Mr. Baxby won Bond University’s prestigious Robert Stable alumni Medal for exceptional achievement in any field by a graduate who has brought distinction to themselves, the University and benefit to their communities. At the time of the award, Mr. Baxby said: “People who are willing to take a risk, make a conscious choice and not just go with the flow are the people really getting on in this world.” While Mr. Baxby remains close to his old boss he did not consult him about his latest business venture on the Coast — Project Evolt. “Taking an idea to Richard is like drinking from a fire hose … there’s no shortage of people pitching ideas to him,” Mr. Baxby said. “But to tackle a new venture without Richard sitting in the background is exciting and scary … there’s no safety backstop. “But they say to do something every day that scares you. and that’s what I am enjoying. And that problem is obesity. Project Evolt is a 12-week health and wellness challenge that tracks your journey using EVOLT 360 body composition analyzers. In a nutshell, the program provides a quick, non-invasive, easy measurement of your body composition delivering a guideline of your lean body mass, body fat mass, and percentage, skeletal muscle mass, visceral fat level, fitness age, fitness score plus much more in less than two minutes. And it does this by tracking 40 points on your body. “Like most things I have done in my life … if I like it, I’m hoping other people will like it,” Mr. Baxby said. “The program is about rewarding you, you feel good about yourself no matter what that activity is. And then there’s the passion of Ed Zouroudis — who is internationally renowned as Muaythai promoter but who sold Mr. Baxby the concept of Project Evolt. “My family has settled in Sydney but I’m back up here for seven or eight days every month,” Mr. Baxby said. “I’m on the council for Bond but I met Ed (Zouroudis) the CEO and founder about nine months ago and thought, I want to be part of this whole wellness movement. “And I feel like it’s my time to give back to an entrepreneur like Ed and take this to the next level. “In regards to business, Australia is a far more exciting than when I left. there’s been a seismic change in technology. This change allows small groups of entrepreneurs — who may not have a lot of money — to do great things. “The only thing standing in between you and success … is yourself. That has never been truer, it’s just a matter of giving it a go. Of all that Mr. Baxby has achieved, family — wife Selina and 15-year-old twins Zara and Imogen; and 11-year-old Amelia — is what he nominated as his greatest success. “There is nothing harder than raising organic beings — who are driven to go out and do whatever they want — and to keep them in the realms of sensibility,” he said. “The years I spent with Richard were extraordinary. He was a great guy to work for. “Now it’s time to test what I have learned.